25 Jan 2019 --- The Californian almond sector, which produces 80 percent of the world’s supply of almonds, is strengthening its 2025 sustainability strategy by including further efforts around water efficiency. 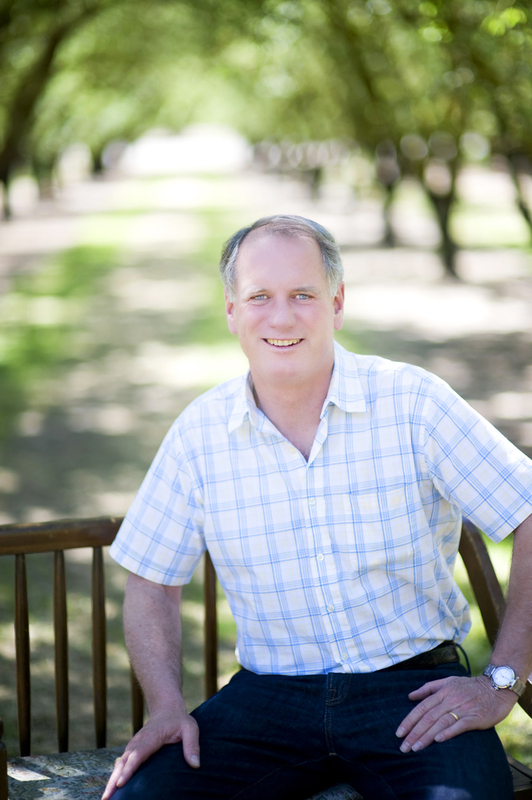 Despite staunch criticism directed at his sector in the wake of a long Californian drought that has now ended, Almond Board of California (ABC) President and CEO Richard Waycott stresses how sustainability has been a key pillar for almond growers in the region for more than 30 years. The 2012-2016 drought was a wakeup call for the state as a whole, rather than an actual stimulus for innovation as such, he claims. Following an unexpected frost in February 2018, that impacted last year’s harvest, this one promises to be “robust,” notwithstanding unforeseen events, ABC forecasts. Waycott notes that the drought served as a general wakeup call around proper infrastructure and how water availability conditions are worsening in the midst of climate change. “Everybody learned a lot during that period. While things like that are always stimulating, it wasn’t that we hadn’t invested in water use efficiency before this,” he notes. 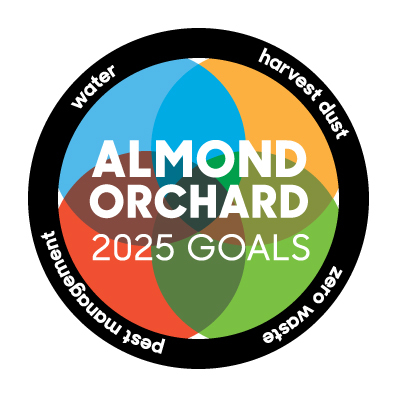 Waycott spoke following the launch of The Almond Orchard 2025 Goals, which set industry-wide targets in the areas of water efficiency, zero waste, pest management and air quality to be met by 2025. Click to Enlarge“We spend a good deal of time envisioning the ‘almond orchard of the future’ and that broke down into nine specific areas focused on areas such as water, pollination and soil. We formed working groups around each one of them. We have innovation going on across a broad spectrum. The four goals are based on ones where we can show the most impact and show further improvement on in the short and long term,” he explains. Further Reducing the Water Used to Grow Almonds: Over the past two decades, California almond farmers have successfully reduced the amount of water used to grow a pound of almonds by 33 percent via improved production practices and adoption of efficient micro-irrigation technology. By 2025, the California almond community commits to reducing the amount of water used to grow a pound of almonds by an additional 20 percent. Achieving Zero Waste in Our Orchards: Almonds grow in a shell, protected by a hull, on a tree: products traditionally used for livestock bedding, cattle feed and electricity generation. Changing markets for these co-products are spurring innovation for higher value uses, both economically and environmentally. By 2025, the California almond community commits to achieving zero waste in their orchards by putting everything they grow to optimal use. “Our objective is that we are a zero waste industry and that all biomass is put to the most optimal use. The 50 percent hull has a single market for it. It goes to dairy cattle feed. The shells that we use are ground down to livestock and poultry beddings, which are very absorbent materials. Sometimes they are used at cogeneration plants that burn different input stocks to create electricity,” says Waycott. “The future there is to find different and more valuable uses for our industry and also for optimal and additional uses for these crops. So we have a lot of research projects going on just looking at various alternatives for these byproducts,” he adds. 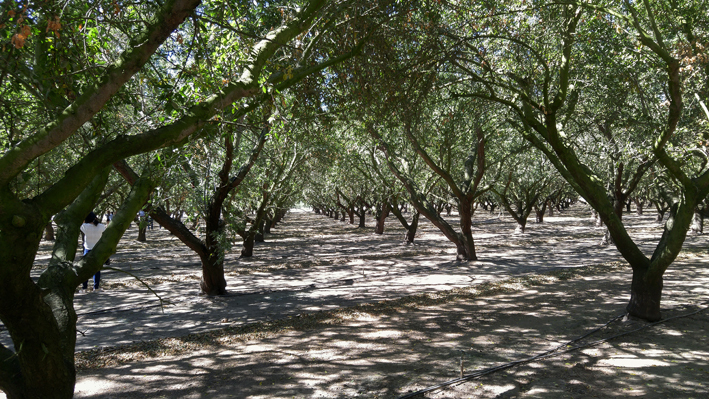 Increasing Adoption of Environmentally Friendly Pest Management Tools: Responsible almond farming requires protecting the crop and trees from bugs, weeds and disease through an integrated pest management approach. This means using tools and techniques like beneficial insects, habitat removal, mating disruption and, when necessary, pesticides. To further protect orchards, employees and communities, by 2025, the industry has committed to increasing adoption of environmentally-friendly pest management tools by 25 percent. “We have been working with innovative pest management for quite a long time and this has been cited by the US Environmental Protection Agency for several years in terms of the efforts being made. But it is a constant evolution to reduce chemical use and to substitute that with non-chemical tools,” Waycott says. It involves basic measures like ensuring that all growers are adhering to the best practices in terms of orchard sanitation. “Others are using traps and mating disruption to try to deal with reproduction in a non-chemical way,” he adds. Improving Local Air Quality During Almond Harvest: California almonds are harvested by shaking the nuts to the ground where they dry naturally in the sun before being swept up and collected, a process that can create dust in local communities. To address this nuisance, the almond community is taking short- and long-term steps to reimagine how they harvest and, by 2025, commits to reducing dust during harvest by 50 percent. Waycott stresses that harvest dust is essentially a visible problem rather than a health concern, but it only adds to heavy air pollution that already hangs in the San Joaquin Valley. “We have low dust harvesting equipment. We want to make sure it is acquired across the industry. The longer view is really to rethink how we harvest completely. That would be to have systems that are completely dust free,” he notes. In addition to the 2025 goals, California almond farmers continue to support research in other areas critical to success, investing in seven new projects focused on honey bee health this year alone. This effort builds on a legacy of US$3.2 million invested in 120 research projects since 1995 addressing the five major factors impacting honey bee health. As part of its ongoing commitment to bee health, the Almond Board has also developed a comprehensive set of Honey Bee Best Management Practices for California almond farmers. Widely adopted, these best practices are constantly evolving to ensure the safety of honey bees during almond pollination and beyond. Click to EnlargeRichard Waycott , President & CEO, Almond Board of CaliforniaThe almond industry has been the focal point for much criticism during the drought years due to its water usage, which Waycott claims was “unfair and unbalanced.” But it has certainly encouraged the industry to consider the message that is conveyed. “The almond industry gets a lot of kudos for many of things that it has achieved in terms of agricultural and environmental practice. During the drought years, we were the agricultural crop that was held up mostly because we use a lot of water and we were at the center of that,” he says. “We have improved our water efficiency quite dramatically since then. We use about the same amount of water as the other tree nuts. We use less water than some other crops and more than some others. Going forward we are talking about what we are doing and the goals that we have set out reiterate that,” he notes. Waycott admitted that the five-year drought impacted production in many ways, with total crop “stable or sideways” for four years, despite strong growth in acreage. “The lack of irrigation water we needed to grow our crops affected the yields. So despite the fact that our acreage was growing each year, our yields were slipping somewhat,” he says. That has recovered now, however. “We did have a frost in February 2018, which affected the 2018/19 crop. Instead of being considerably larger than the previous year means that it will be about the same size,” he adds. “We have bloom starting in three weeks and will hopefully have a good bloom and increase our crop size in 2019/20. We have the acreage and the weather seems to be going well and should have adequate water. Barring unforeseen events, such as a frost, we should have a robust harvest,” he notes. Waycott points out that the current 2018/19 crop is being grown on just over 1 million acres of irrigated almond orchard (1.070 million), with recent acreage expansion running at a steady 5-6 percent per year. The almond growers currently have some 300,000 acres that are non-bearing, which are planted but not yet producing a sizeable crop. They will come into production in the next three to five years, as some older acreage is removed. The forecast for the next five to 10 years will be for continued expansion. The expansion is happening because California’s cusp of farming is continually expanding. “We grow about 350 crops in the state and there is some attrition going on as water becomes more scarce and really the crops that are most profitable are able to navigate the regulatory environment, make the investment in sustainable practices and modern technology. Almonds fit that profile,” he says. The outlook looks positive for continued growth, he claims. The sector is now also required to comply with California’s Sustainable Ground Water Management Act, which entered into force last year. “This act regulates groundwater in California for the first time. In the past, growers could put in a well and pump as much water as they needed. In the future, that will not be the case. We feel that almonds are in a good position to meet these new realities,” he adds. There are also clear trade challenges on the horizon for Californian almond growers who export 70 percent of their crop to over 90 countries. The European market represents some 40 percent of exports, Asia-Pacific for 38-39 percent, the Middle East 12 percent, with the rest of the world accounting for the remaining 8-9 percent. Waycott admits that the rhetoric has fueled uncertainty for US exporters of various crops, including almonds. “We feel that the real impact is how the trade rhetoric of last year influenced the global market that created a lot of uncertainty with so many crops exported from the US. That really depressed global pricing,” he says. The trade war brewing between the US and China has heavily impacted export volumes to that market, in particular. In the crop year 2017/18, China (which includes volumes going into Hong Kong and Vietnam) represented 10 percent of all shipments and 15 percent of all exports for ABC. Huge surges in tariffs will surely see this change. “China has been an important market for us and we have been operating there for 20 years with one of our largest consumer programs. Our tariff went from 10 percent to 50 percent as a result of the retaliatory activities that went back and forth last year. Our December position report shows that volumes to China were down 14 percent and those to Vietnam were up 14 percent. They do very have very different volumes, however. But there has been somewhat of a shift in direction,” he notes. 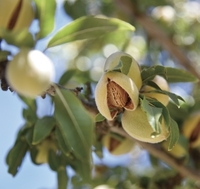 New product data on almond introductions support this innovation climate. Application innovation is thriving across the board, with Waycott making several tips for NPD to look out for. “The newest areas relate to the furthering of almond milk going more into cheese products and being increasingly incorporated into plant-based meats. Almond flour and defatted flour is another area, as is almond oil, which is being produced by non-traditional suppliers in targeting non-foods and cosmetics too. Almond butter seems to be increasingly finding its way into confectionery and other products,” he concludes. These remain exciting times for a heavily farmed nut with near ubiquitous application potential.